The Altimaster II was originally designed by Stephen L. Snyder almost 50 years ago. 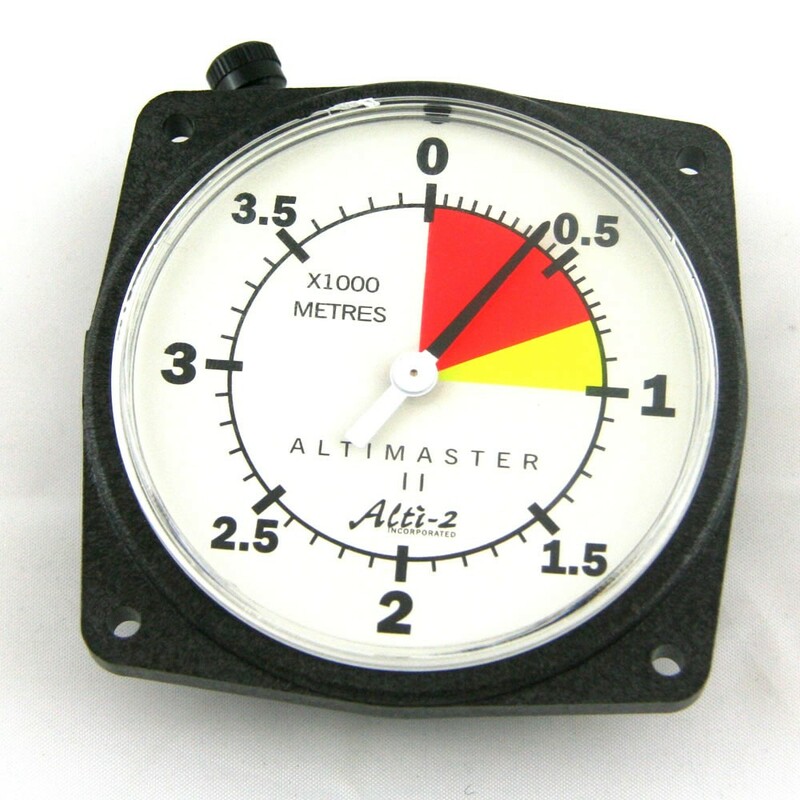 The Altimaster II face is a registered trademark and is internationally recognized. Steve Snyder introduced the Altimaster concept of: 0-12,000' which was founded on the belief that most people are accustomed to reading a clock face, and that a freefall takes about 60 seconds -- one sweep of the second hand. The needle points at the numbers and does not cover them up. The Altimaster II contains a durable mechanism made from temperature compensating metals for minimal friction and precision accuracy with an altitude range of 16,000 feet. Face plate available in feet or meters. This is an old (at least 40 years old) design and it has stood the test of time. It is VERY easy to read and generally works well. Older Alti IIs sometimes suffer from movement sticking. Alti IIs, when they get sticky, usually just stick in climb and under open canopy, the vibration of freefall keeps it from sticking when you need it. Another problem which shows up less often is binding zero adjust gears. The lenses inevitably become scratched, and the adjustment stem "O ring" gets old and crack, but both are very easy to replace. Most old Alti IIs work great with zero problems. Alti 2 offers full service and support. I have jumped just about every altimeter made for skydiving including the popular Alti III, the horrible Alti V, the Northstar, Saphire, FT 50, Digitude, Irvin military, and SSE military. My favorite is the Alti II because it is light, thin, and VERY easy to read. Alti 2 has made a few internal design changes to improve mfg economics, but they are still great altimeters. One design change I would make is to recess the lens or make a protruding guard around the circumference so the lens doesn't scratch so easily. Customer support is excellent and that makes the Alti II a good choice. If you break it, Alti 2 can fix it fast. Repair charges range from free to reasonable. If you are considering the purchase of a used SSE altimeter BE SURE it is NOT an Alti V (five). They are dogs and should be scrapped. It was never designed for long life and it when failure occurs it is often a dangerous mode in which the dial spins freely. This can be way more dangerous than a stuck needle as you see needle movement, assume its OK, but it could be thousands of feet off. Don't blame Alti-2, they didnt make these, SSE did. They did serve a function, providing cheap student altimeters, but they were never made for the long haul.